Richard Schaefer, CEO of Ringstar Sports, was very impressed with Saturday night's performance by IBF welterweight champion Errol Spence (25-0, 21 KOs). Schaefer, who works closely with four division world champion Mikey Garcia, watched his boxer get dominated over twelve rounds by Spence at AT&T Stadium in Arlington Texas. Garcia (39-1, 30 KOs), who was moving up by two weight divisions, suffered his first career defeat. Schaefer believed Garcia was be the more skilled fighter, with Spence holding the edge with size and power. But instead it was Spence who dominated with his skill. "He didn't win that fight with size or with power - he won that fight with skills. And we all thought if it came down to skills, Mikey Garcia would be the one to win the fight based on skills. But based on skills, Errol Spence won that fight and it was absolutely beautiful to watch. His combinations and his display of skills, I've hardly seen anything like it," Schaefer said. Based on what he witnessed, Schaefer now views Spence was the best pound-for-pound fighter in the sport. "The new pound for pound king is right here. The best fighter in the world comes from Dallas," Schaefer said. "Errol Spence is in a perfect weight class, he's in the deepest weight class. There are so many great fights that can be done at welterweight. 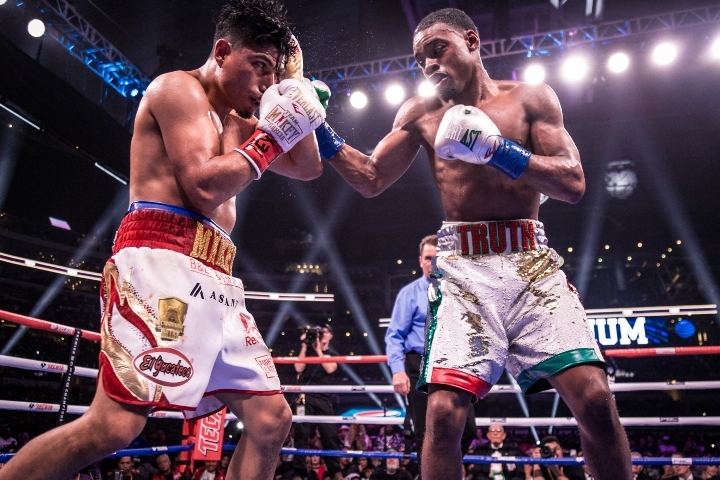 There are so many great fights, such a long list, and Errol Spence is not afraid to challenge any of them. "The question is, are the opponents afraid to challenge Errol Spence. He had difficult finding an opponent going into this fight and Mikey Garcia had the balls to stand up and say 'hey, I'm going to challenge you.' And I think with this performance tonight, Errol Spence didn't make it easier on himself to find opponents." [QUOTE=MEXfistology;19600609]But yet you're here watching pbc fighters fight , Soo just hush and keep watching the fights for what they are[/QUOTE] Who says I watch pbc fights? Pbc and it’s shills are a cancer to boxing. You hush. Top Headlines Andy Ruiz Emerges as Frontrunner in Joshua Sweepstakes Srisaket Sor Rungvisai-Juan Francisco Estrada II: Stats & Stakes Hearn: Andy Ruiz, Michael Hunter Are Credible Fights For Joshua Roman, Doheny Agree Their Bout Will Name Division's Best Canelo: Nothing in My Contract Binds Me To Golovkin Trilogy Rob Brant vs. Ryota Murata Rematch Finalized For July 12 Marcos Maidana Says He is No Longer Coming Back To Boxing Alexander-Redkach, Monroe-Centeno Heads to San Jacinto Photos: Daniel Roman, TJ Doheny - Face To Face, Final Presser Photos: Jessie Vargas, Humberto Soto - Face To Face at Presser Photos: Sor Rungvisai, Juan Francisco Estrada - Go Face To Face Photos: Yves Ulysse, Steve Claggett - Ready For Rematch Clash News: Jackson England, NVBHOF Information, Cartagena, More Nonito Donaire vs. Stephon Young Finalized For WBSS Abel Sanchez Slams "Greedy, Ungrateful" Golovkin For The Split Gennady Golovkin Decides To Part Ways With Abel Sanchez Barthelemy: If Robert Easter Wants a War - We'll Have a War Don King To Hearn: Trevor Bryan is Ready To Face Joshua Slava Shabranskyy vs. Allan Green Set For May 10, Burbank Sor Rungvisai Hopes Estrada Comes Looking For a Knockout Tyson Fury vs. Tom Schwarz - Ticket Information Shawn Porter Praises Garcia, Motivated To Face Errol Spence Zolani Tete Suffers Injury, Donaire Fight Status To Be Determined Luis Ortiz Turned Down $5M, Asked For $10M To Fight Joshua 6/1 Josh Warrington vs. Kid Galahad - Undercard Update Canelo Alvarez-Daniel Jacobs: NSAC Approves Judges For Fight Jessie Vargas: Brook Wastes My Time, I'd Fight Liam Smith Vergil Ortiz vs. Mauricio Herrera is Co-Main To Canelo-Jacobs Nelson Feels Ortiz Too Dangerous For Joshua on Short-Notice Prograis: Relikh is Definitely The Biggest Fight of My Career Loeffler: If Andrade Makes Sense For GGG In Future, Why Not? Reality check: Crawford-Spence not happening soon, says Ellerbe Hunter Warns Joshua: I'll Be Tougher Challenger Than Miller Mohamed Mimoune Very Confident of Shocking Viktor Postol Daniel Roman: The Plan is To Steal The Show, I'll Break Doheny Brook: Amir Khan Deserves a Smack For Questioning Sexuality Danny Garcia: I Wants Rematches With Thurman and Porter John Scully Discusses His Passion To Help Fellow Fighters Loeffler: To Me Golovkin is Undefeated, Best at 160, Beat Canelo Joshua Jabs Jarrell Miller: I'll Still Pay Your Mum's Rent!